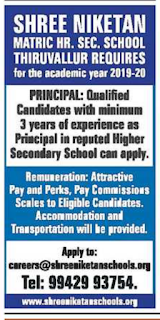 Shree Niketan Higher Secondary School,Thiruvallur,Chennai has advertised for the recruitment of Teaching Faculty- Principal jobs vacancies. Interested and eligible job aspirants are requested to apply immediately.Check out further more details below. Name of the School: Shree Nilayam Matric Higher Secondary School,Thiruvallur,Chennai. About School: Shree E. Panneerselvam is a Charted Accountant, who has carved a niche for himself in the chosen field, has always been driven by the passion of spreading quality education in the state of Tamil Nadu. As a first step, he founded a reputed school in Vellore, Tamil Nadu and has been associated with many educational projects all over the state. 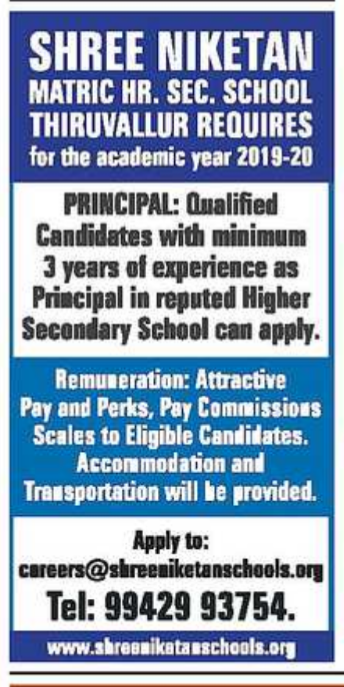 Qualified candidates with minimum three years of experience as principal in reputed higher secondary school can apply. Salary Package:Attractive pay and perks,pay commissions scales to eligible candidates. Accommodation and transportation will be provided. How to Apply: Candidates must send their detailed resume to mail.